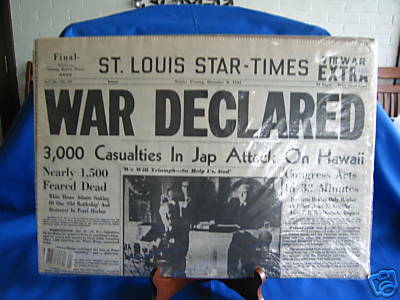 It was December 7, 1941 when my parents showed me the morning paper from St. Louis that told the story of the Pearl Harbor attack. My memories are probably much different from that of other people who live here in Hawaii, but they are still very strong. I was a 7-year-old in Southern Illinois. My father tried to get into the military as a chaplain, but at 32 years of age, he was considered too old. His younger brother served, however, first as an enlisted man. He had many stories to tell about frozen feet from marching through the snow, of fighting in the Battle of the Bulge, hiding out in barns, but I won’t go into all of those here. He went back to college and grad school, later became a chaplain in the Army. This later took him to Korea and Viet Nam twice. He stayed in the Army until he retired. Another of my uncles went into the Navy right out of college as an officer. He served as an officer on a ship that went to China. The memories of how we lived through those next years will never go away – not for me, and certainly not for the people who were living in Hawaii at the time. Although none of us wanted the tragedy of war, we all pitched in and did our part. In the spring following the Pearl Harbor attack, rationing was put into place, and lasted until 1945. This site shows pictures of the ration books, and describes other measures that our country took in order to do their part for the war effort. Each car had a stamp on the window that indicated how much gas he could buy. There were A stamps that allowed the owner to purchase 3 to 4 gallons per week. If someone’s car was essential to the war effort, they got a B stamp and 8 gallons per week. I can still remember the C stamp on our car which meant unlimited gasoline for physicians, ministers, mail carriers, and railroad workers. My father was a pastor, so he was allowed more gasoline. Then there was the T stamp for trucks, and the X stamp for congress members and other VIPs. Foods like sugar, butter, milk, cheese, eggs, coffee, meat and canned goods were all given a specific stamp value. When the government turned to its citizens to encourage them to plant “Victory Gardens,” nearly 20 million Americans answered the call. Going through boxes in a recent move, I found some old ration stamps for sugar I had kept. I remember that with a child’s logic, I named our dog “Sugar” because he would get under the house and was “hard to get.” Children, as well as adults, were encouraged to buy stamps for war bonds. I also found an old book on victory sewing that showed how to make dresses for little girls out of men’s old shirts. I wore many skirts and jackets made out of my father’s worn out suits, even as late as my high school years. Another fond memory that I still hold is learning how to knit by making little 4″ X 4″ squares that would be put together into blankets. These blankets would be sent to England through a campaign called “Bundles for Britain.” A good friend from the UK was among the children evacuated from London. I often wonder if he got one of my blankets! 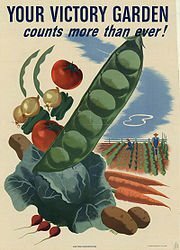 Probably one of the most memorable events from that era are the many Victory Gardens that were started, which meant more supplies could be sent to our troops. Read more about the history of Victory Gardens here . 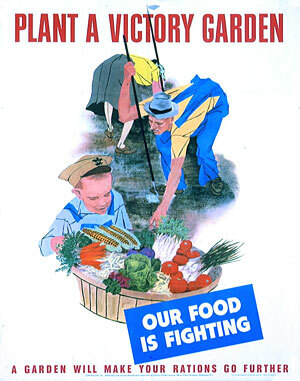 These gardens were “not a drudgery, but a pastime, and a national duty.” A poster campaign (“Plant more in ’44!”) encouraged the planting of Victory Gardens. These are copies of two old posters from that era, but they carry just as valid a message today. In my raised beds, I am working on my own Victory Garden. As I build more beds, I’ll be able to plant more. Right now, I have tomatoes, string beans, mustard greens, collard greens, red chard, and peanuts, plus I have eggs from my chickens and my freezer has a freshly butchered and frozen pig. Not only do I encourage you to plant even just a few seeds in a revival of the Victory Garden, but I hope you encourage our president-elect Obama and his family to grow a Victory Garden on the White House lawn. He would not be the first president to do so. Please go to Eat The View and sign a petition asking him to start planting. Previous Previous post: How Do You Dance Your Life?